Legion of Boom: What the Seattle Seahawks have in common with the last New England Patriots team to win a Super Bowl. What the Seahawks’ “Legion of Boom” has in common with the last Patriots championship team. 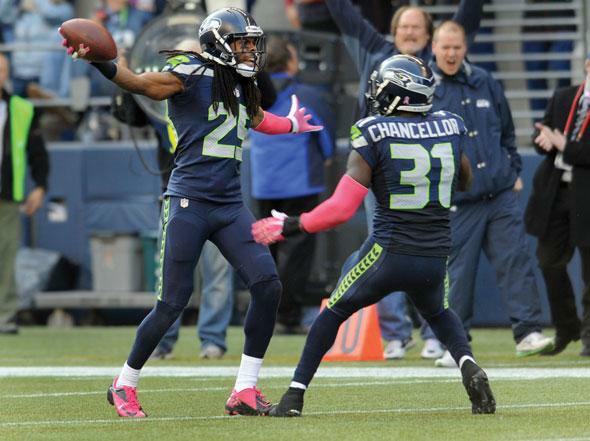 Seahawks cornerback Richard Sherman (#25) celebrates an interception with strong safety Kam Chancellor (#31) during the fourth quarter of a game against the Tennessee Titans on Oct. 13, 2013, in Seattle. On Sunday the Seattle Seahawks will try to be the first team to repeat as Super Bowl champions since the 2003-2004 New England Patriots. There are many similarities between the last Patriots championship team and this Seahawks one, particularly between the early career arcs of quarterbacks Tom Brady and Russell Wilson. But perhaps the most relevant parallel is between Seattle’s vaunted “Legion of Boom” secondary and the secondary of the repeat-champion Patriots of a decade ago. Both teams played a punishing style of pass defense that was so effective (especially against Peyton Manning) that the league had to either change its rules, or, in the case of the Pats, remind the refs to enforce them. After humiliating Manning and the explosive Broncos offense in last year’s championship match, Seattle’s defense dominated NFL offenses again in 2014, allowing the fewest points (15.9 per game), total yards (267.1 per game), and passing yards (185.6 per game) for the second consecutive year. They did this at a time when the league’s competitive balance has never been more in favor of the offense, especially passing offense. NFL offenses passed for what was then an all-time high 235.6 yards per game in 2013, and that number increased to 236.3 in 2014. New rules were put into place this offseason to limit contact between defenders and receivers, rules that don’t seem to protect player safety so much as continue to strip defenders of their ability to disrupt the offense’s rhythm and timing. The old rule, called the “Mel Blount rule” after the Steelers’ Hall of Fame cornerback, but later known as the chuck rule, was originally implemented in 1978, and helped give birth to the modern NFL. It stated that after five yards past the line of scrimmage, a defender could not initiate contact “that redirects, restricts or impedes a receiver in any way.” The new rule states that if the quarterback is in the pocket, the defender can’t initiate contact at all after five yards. The Seahawks felt that the change was implemented because they were the fly in the league’s pass-happy ointment. “They look at it and say, ‘We may get called for one but not 10,’ ” Mike Pereira, a former vice president of officiating for the NFL, told the Wall Street Journal last January. This is nothing new. The 2003 Patriots, a team that led the league in defense while allowing 14.9 points per game, was also built around a dominant secondary notorious for physically abusing receivers downfield and challenging refs to throw a flag. This led to the league implementing a “point of emphasis” on defensive holding and illegal contact that was nicknamed the “Ty Law rule” after the Patriot’s all-pro cornerback. In 2004, after the Patriots won their second Super Bowl in three years, the league once again recommitted to the chuck rule, the enforcement of which seems to erode every 10 years (the league re-emphasized or altered the rule in 1994, 2004, and 2014). Rules can, it turns out, atrophy over time. Just look at traveling in the NBA. Although passing yards per game during the 2003 season were the lowest since 1992, the league’s “point of emphasis” on enforcing the chuck rule was widely attributed to the Patriots’ manhandling of Colts receivers on their way to winning the 2003 AFC championship, a game in which Ty Law had the same amount of interceptions as Marvin Harrison had receptions (three). After the game, Colts president Bill Polian, along with then–Titans head coach Jeff Fisher, led a charge to once again remind officials to enforce the chuck rule. “Everyone felt that defensive backs have been allowed to get away with more things the last couple of seasons,” Fisher said at the time. Both Polian and Fisher were members of the league’s competition committee, and their teams were a combined 27-10 in 2003 (including the postseason), but 0-4 against the Patriots, who eliminated both teams from the playoffs. The league continued to make enforcement of the chuck rule a point of emphasis between 2004 and 2007, and the league’s passing yards per game have increased every year since the 2008 season. The rule change, or re-emphasis, or whatever you’d like to call it, didn’t seem to affect the Patriots, who repeated as champs in 2004, while only slipping from first to second in points allowed per game. Likewise, the new rules haven’t seemed to make the Legion of Boom any less terrifying for opposing offenses. Seattle reached the Super Bowl for the second year in a row by playing to the edge of the rules, whatever they happen to be. The Seahawks led the league in overall penalties the last two years. Second place this year? The New England Patriots. Not that it needs to be said again during this particular Super Bowl week, but teams that play aggressive and push the edge of legality are, not surprisingly, often the most successful.